A quick note: The numbers here are based on baby name data published by the state Department of Health for the years 2007-2011 (the latest available through open.ny.gov). 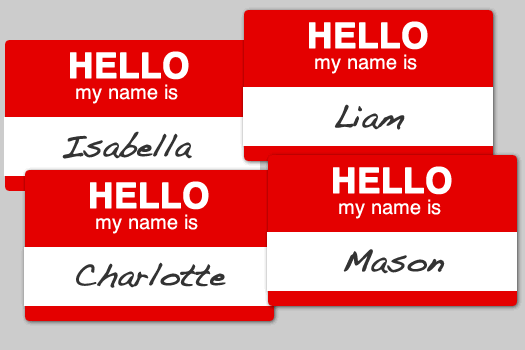 DOH doesn't provide name counts if a name was given to fewer than five babies in a county in a year -- so the lowest count for any of these names in any year is five. As a result, the totals for some of these names are probably missing a few counts, and undoubtedly there are some names used that are not represented. Also: Because of the no-count-under-five issue, 0 doesn't necessarily mean 0 -- it could just mean fewer than five. Also: Embedded in large format above are two graphs tracking the popularity of the names over the five years. The graphs are a little hard to read, but they're clickable. + There aren't really a lot of surprises here. The group of names at the top of the chart is roughly similar to recent charts for the entire state and nation. + And as it was nationally in 2011, the boys name Mason is on a big upswing in the Capital Region. In 2009 there were 36 newborn boys given the name. In 2011, 65 got the name -- making it the most popular boys name that year. + Two girls name on the upswing: Avery and Charlotte -- both were given to 25 girls in 2011 after not being used more than 11 times in any of the previous four years. + There's a noticeable dip in the number of names represented in the data for 2010. This could be the result of some issue with the numbers (there's no name represented with fewer than 10 uses that year). We could have made a mistake (very possible). Or it could just be a dip in the number of babies born -- though NYS DOH data on the overall number of births per year doesn't really match up with that. In the Capital Region core in 2010 the number of births was down almost 3.5 percent compared to 2007 -- that doesn't seem like enough to prompt such a sharp dip. We're going to dig around a bit. It's just a matter of time before Gertrude becomes popular again. "... I want to say... Mason... Clifford! Little Clifford." I'm guessing the Capital Region is not full of Clifford fans. If only, that would be such a great mocking nickname. Ryan, I think you and I are the only people in the Capital Region who have even SEEN Clifford, let alone well versed enough to quote it. Oh noooooo! My name is going the way of the dinosaurs! Sad face. Good lord, the ONLY thing I remember about Clifford was never wanting to see it again. I recall that film and Cabin Boy both being extremely difficult to endure as a teenager. I also must hate myself because now I feel like I should revisit them as an adult. Bob, Gertie is an adorable name. I'm serious when I say I'd love to see it make a comeback. @Melissa: It's a quirk of the data -- the counts for names used fewer than five times in a county in a year weren't reported by the state. So "0" doesn't necessarily mean 0. I'm going to see if I can adjust the spreadsheet to make that more clear. What's up with the 2010 girls' data? Lots of 0/less than 5. It seems odd that names that were very popular in 2009 & 2011 (Mia, Grace) would fall off the list and reappear a year later. I appreciate a well-given name. It's one of few things that typically sticks your whole life. I do find it amusing though that so many people want their kid to have a unique name that there's a growing chance they actually aren't. So....if your kid's name is on the list, are you a winner or a loser? I really hope that Charlotte will not become in my daughter's time what Jennifer was in mine, although she's got a bit of a jump on the 25 Charlottes of 2011. Its such a solid name, and one that does not lend itself to getting cute with the spelling. Sharlit looks like, well, not good.